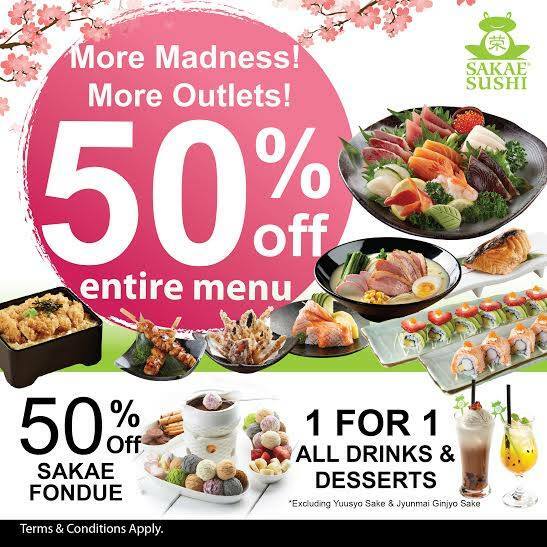 Starting 31 August 2015, Enjoy 50% off the ENTIRE Menu at 4 selected Sakae Sushi outlets, with 50% off Sakae Fondue & 1-for-1 drinks and dessert! Entire menu food list excludes all drinks and desserts. Food wastage will be charged accordingly based on ala carte food pricing. Prices are subject to 10% service charge and prevailing government tax. This promotion is not valid with any other Card rebates, discounts or promotions unless otherwise stated. Sakae Holdings Ltd. reserves the right to amend the terms and conditions at its absolute discretion without prior notice.